December 5, 2017 December 5, 2017 Dan O.
Vivian (Dolly Wells) is a jaded filmmaker who believes that marriage is an outmoded concept that needs a reboot. Hoping to prove her theory, she begins to interview three couples at various stages in their relationships. Even though it wasn’t a perfect movie, Lake Bell’s directorial debut, In a World…, proved that she had something more on her mind than just humor. It was a small, somewhat subtle look at women trying their best to get by, sisters trying to connect, and something of a showbiz-satire about how the men always get by, and the women are forced to stand back. It was a messy movie, but its ambitions and its cast was so likable and charming, it was hard to fully hate. It’s why I Do…Until I Don’t feels like it’s made from somebody else entirely. Rather than being a funny, relatively heartwarming look at a bunch of different people, like her first movie was, Bell’s latest is so over-the-top, silly, and random, it almost feels like she made it on a whim. It’s as if she had been waiting so long to get a movie off of the ground, didn’t have a perfectly fresh idea in her head, but stumbled upon a bunch of money and thought that something would work anyway, regardless of how crummy the material was. Oh man. How they’ve been in so much better. And that’s where it all comes down to: The movie just isn’t funny. It attempts to poke fun at marriage, its norms, and the sanctity of it all, but mostly comes down to making fun of a bunch of characters we never really get to know or care about, because they never come close to being human. They’re all goofy caricatures who are made so that Bell can set them up for whatever unfunny bits and pieces of comedy she chooses. It’s a shame to be picking on her, too, because in mostly everything I’ve ever seen her in, she’s constantly lovable and fun – but none of that shows here. Not with her writing, her directing, or hell, especially not her acting. In fact, Bell’s performance is probably the worst as she totally over-does this character’s constant neurotic ticks, with all of the stuttering, flinching, and turning away. It’s like she’s doing a Woody Allen impersonation, but only saw one movie and decided to just roll with it. Same goes to Ed Helms as her husband here who, does what he can, but just feels like a typically dull husband who wants something more out of life and can’t quite perform in the sack. It’s actually a perfect role for Helms, but because he’s played it so many times before and there’s not much depth to this actual character, it doesn’t wholly work. Bring back Doll & Em! Instead, it feels like he’s slumming. And the same could be said for just about everybody else. Dolly Wells plays the documentary film-maker who gets maybe one or two laughs, because her character seems like the voice-of-reason/bystander to all of this, but then she just ends up being a villain that the movie feels the need to bash; Amber Heard and Wyatt Cenac play a hippie-couple who are so formulaic in their ways, it already feels dated by the first instance we see of them; and Paul Reiser and Mary Steenburgen, try as they might, seem like they deserve a much better movie. They play an older couple who are running through their own little issues and trying to figure out what the other wants with their rest of their lives and it’s only here, in this one subplot, where it feels like Bell is touching at something interesting and compelling. But then, she drops the ball when she decides to focus on all of the other characters and their wild hi-jinx that, honestly, aren’t all that wild, nor all that funny. They’re just annoying and ridiculous and it makes you wish that Bell stick with whatever sort of inspiration she had from her first flick. 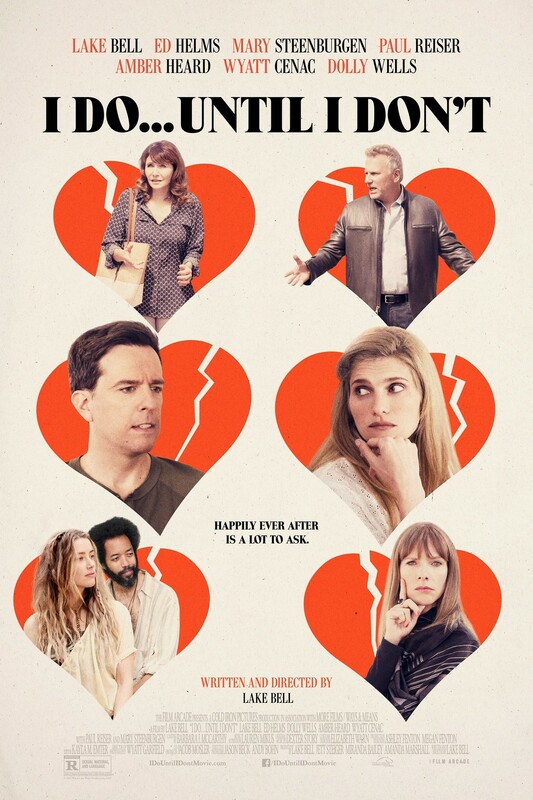 Consensus: Even with a solid ensemble of likable people, I Do…Until I Don’t squanders all potential with a sitcom-y premise and even more ridiculous jokes and gags that go nowhere. They’re like hippies, but in 2017. Ha! Ha!